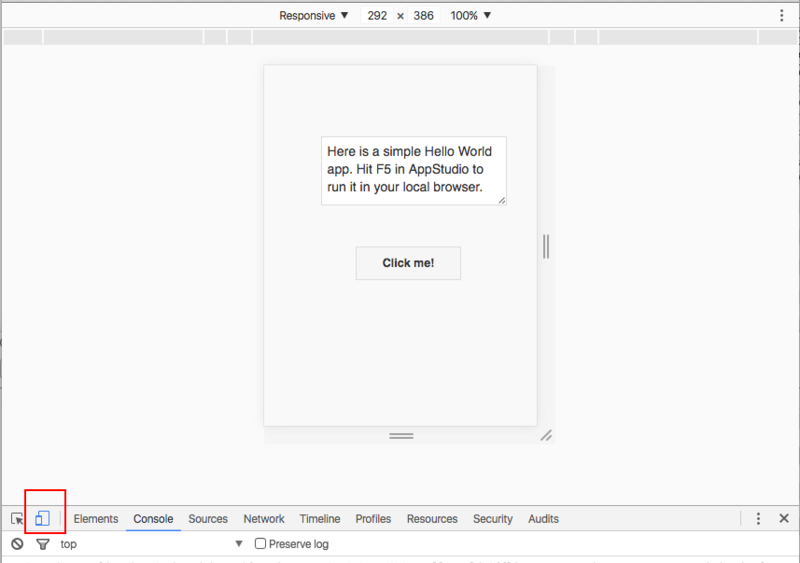 The purpose of this tutorial is to demonstrate how to use Google's Chrome browser to debug your AppStudio app. AppStudio programs run in a browser. While the final target for the app may be a device like an iPhone or iPad, it's convenient to test the program on the desktop. Most any browser will work, but we have found the debugging tools on Google's Chrome work well and are easy to use. If you would prefer to use Safari's debugger, Apple has some excellent documentation. Got a useful debugging tip? Let us know! Let's create a short program with an error and see how it works. This program won't work. The variable B in the second line does not have a value. Run the program. A blank browser window will appear. The MsgBox statement is not executed. Let's open the Console and find out what is going on. In the bottom panel, you should see "Uncaught ReferenceError: B is not defined. There is a lot of information here, but it's easy to see what the problem is. Simply fix it and run the problem again. You can force your program to stop execution, then examine useful information in the Console. There are two ways to stop the program: you can put a special statement into your code before you run the program, or you can use the Console to add a breakpoint once it is running. Let's give this a try. s="This is a local string"
There are a number of interesting things to observe here. In the Code Window, you can see the debugger statement is highlighted. On the right, you can see the Call Stack, showing how execution got to the debugger statement. You can also see local variables. The variable s is shown with its value. If you hover the pointer over a variable name, its value will be displayed. If you enter a variable name into the lower panel, its value will be displayed. Global variables (like count in this example, can also be examined in the "Local" window on the right. Click on the triangle beside the work "this" and it will expand to show all globals. You can set a breakpoint at runtime by clicking on its line number in the Code Window. If you right click on the blue breakpoint indicator you created in the line number column, you can set a condition under which the breakpoint is effective. It will then turn orange. In this case, the breakpoint condition has been set to "count>10". Using F8, execution has been continued until the breakpoint is reached. Once again, variable's values can be checked, etc. If you click on the database itself, you see an empty window area with a prompt on the right hand side. There you can enter SQL statements directly, e.g. Copy/paste them from your program for testing, or do a "select * from <tablename>" to see the effect of your statements inside a table. You can also click on the table on the left, this also shows the data inside the table. In the above screen, we have selected the "Application" tab along the top of the Console. The Northwind database has been expanded to show what tables are in it: we have selected Customers Selecting that causes the records in that table to be displayed. The Chrome Debugger makes it easy to see how your app will look on different screen sizes. This is very useful if you are using responsive design to build your app. On the top bar, you can select from a list of popular devices (iPhone, iPads, Nexus) or select Responsive, which allows you to dynamically resize the screen. You will need Chrome 32 or later on both the device and the desktop. Your device needs to be connected by its USB cable. Follow the instructions here. You will probably need to install the USB driver for your device. Once it is installed, type about:inspect into Chrome’s url bar and you will connect. The debugger will work just like the Chrome Desktop Debugger. Just like on Windows, except there are no drivers to install. This page was last edited on 4 November 2016, at 20:24.